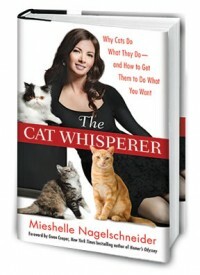 Mieshelle has guest starred as The Cat Whisperer on Animal Planet, MTV, and recently finished filming a cat behavior documentary for National Geographic. She was the International Cat Behavior Expert for Whiskas traveling the globe with the mission to elevate the status of the cat along with the Animal Welfare League. Nationally and internationally, Mieshelle is a frequent contributor and guest on T.V., radio, and publications, including Animal Planet, Fox, USA Today, The Circle, The Sunrise Show, Martha Stewart Living Radio, Zoo Peeps, This Wildlife, New York Post, Cat Fancy Magazine, Salon.com, New Republic, Feline Wellness, Petside.com, Cat Channel, The Daily Cat, and Pets Magazine. In addition to her important platforms like anti-declawing and elevating the status of the black cat, Mieshelle believes that saving millions of cats from euthanasia each year begins with cat owners understanding and respecting the natural instincts of their domestic cat and sound behavior advice in solving behavior issues.